Well yesterday marked a new era for those of us who live in Kelowna, BC. The long-awaited opening of the new William R. Bennett Bridge. Finally it has been in the works for what seemed an eternity. Kelowna is about 470 km east of Vancouver and about 600 km west of Calgary. Kelowna is often compared to sunny California as a result of its warm climate, explosive population growth and vineyard and golf course filled scenery. For those of us living on the Westside who work in in Kelowna (or vice versa), there has been one single, 3-lane bride that we have to cross each day to go to work. In the summertime , what normally should be a 15-20 minute drive can end up taking 60-90+ minutes. Not fun, so it was with great anticipation that the province decided to construct a new bridge. Enter the new William R. Bennett Bridge. 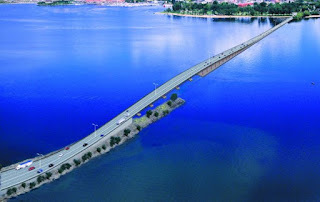 According to the official site, the William R. Bennett Bridge replaces the current three-lane Okanagan Lake Bridge in Kelowna. This corridor is the most congested stretch of highway outside the Lower Mainland accommodating an average of 46,000 vehicles per day. By 2017, more than 69,000 vehicles are expected to use the new bridge each day. I am just curious as to who was the brainiac behind building a five lane bride? Why not make it six lanes? I'll never understand the reasoning for this. People are already suggesting that a second bridge is in order. To sit in traffic for hours at a time due to poor infrastructure and planning in this day and age just doesn't seem right. The good news is that they have made a decent bike lane, so I'll be making the 25km round trip more often now. I will drive across the new bridge for the first time today after work to see if this was $150 million that was well spent or not. I'll see you in traffic.